MUNTurkey.com: Hello Alexia Sideris, we have met you first time in MUNPlanet.com and we loved your blogs and articles. Could you please tell us more about yourself? Hello MUNTurkey.com members, very nice to meet you even online! Thank you very much for your kind words and allow me to return the compliment by saying that your website is effortlessly effective and very useful!I am French-Greek with some strong connections toTurkey though since my mother’s family lived in Istanbul and Izmir until the events of 1922. I have studied law and real estate and currently working in the field of relating. MUNTurkey.com: We are guessing that you are from Greece. What are the things that you like about Greece? What does Greece mean to you? Well, you are correct! I love that is a global patchwork of modern trends and that everyone is welcomed here. It means creative chaos with any interpretations of it. MUNTurkey.com: Education is a key factor in our lives. Especially today, education holds great importance in individuals’ life. Alexia, we would love to hear about your education background and future plans. Thank you for being so kind, most of the time people actually love to tell me about their lives and expect me to write about them! Having studied mostly in the field of humanities, I would say that anything legally pays the bill is more than fine! Education indeed holds great importance in our lives and this is why projects like MUNTurkey.com should be further encouraged to spread the positive meaning of simulations. MUNTurkey.com: Here it comes the most important part! We are all excited to learn about your MUN career. How did you start? Is there someone special who guided you into the MUN world? How did your career start? Wow, you really want to learn about me-flattered and drinks on me if in the same city! It started 10 years ago, as a bet with my father who believed that I was extremely shy and incapable to stand on my positions when needed, so I had to either run for student’s council or join the debate/mun team. Well, you can guess what I presumed. I have to say though, that it was not until GIMUN 2016 (Geneva, Switzerland) whose SGs were the most hardworking and dedicated to their task people, namely Michaela Dorcikova & Anthony Papadopoulos. Up until that date, I was happily practising MUN as a hobby. After working with them though, I joined consulting webpages and MUN teaching activities. With regards to someone special, I really have no idea what to answer because MUN offers you the opportunity to meet and interact with a lot of people and keep whatever you find interesting. Additionally, meeting people under somewhat stressful conditions can help you see the inner nature of somebody on a fast track, that’s why I really can not mention one person only. My career started from high school years but I have been essentially active the last 5. MUNTurkey.com: How can you define Model United Nations? If you got a chance to design a conference, what would you change? Here is the thing, the mere definition of simulations can actually help us understand the differentiation in simulating practices and the root causes of current MUN problems. For me, it is an extracurricular activity aiming to increase our interest in global affairs and practise a foreign language and our social skills. Our simulating choices whether that is DISEC or European Council are pointless if we are not enjoying what we are doing, so the main thing I would change in conference designing is agendas of committees. We see more and more committees trying to follow the flow of the actual organ, resulting in extremely bored people-ie, the law is interesting as long as we choose the right topics to discuss and not re-evaluating fifty years old cases. 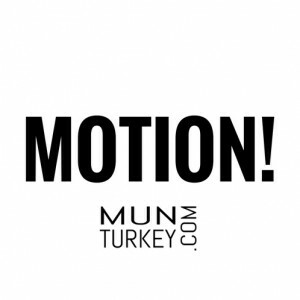 MUNTurkey.com: Have you ever attended any MUN conferences as a chairperson or got any other extra duties besides being a delegate? Could you please tell us more about your previous positions in MUN conferences? Quite a few actually that would be very boring to mention in detail, to be honest! The only position I have yet to enjoy is the one of being part of the press team-I can tell you that my experiences led me to land a position as an AC for WorldMUN 2018 so, they were good enough I guess. My mun mentality is British with a strong international element. MUNTurkey.com: What can you tell about motivating people to join MUN conferences? We believe that chairpersons of the conferences are vitally important for reaching more people.Some chairpersons use different techniques while chairing. To be honest we loved the idea to motivate the delegates and even vice chairs & guests during the sessions. What can you tell us about using the techniques such as interesting ice-breakers and continuous role-play during the conference? Don’t join conferences, I wouldn’t like future co-applicants for any jobs to have the same skills as me! Jokes aside though, any activity involving public speaking and exposure to a safe crowd like MUN is only soul healing and fun if we keep in mind that we need to practise and not just get drunk at cheap prices. The different chairing styles in my opinion change and depend on the level, type and size of the committee. Generally, I go as I would have liked to be treated but anything that works and makes the majority of the committee to talk about substantial amounts of time is acceptable. The tricky point is to respect the borders between humour and potentially insulting behaviour, which is the reason that some people have a hard time adjusting to the simulating customs of another country. MUNTurkey.com: Most chairpersons often have difficulty in choosing the best delegates and delivering other awards to the delegates. How was your turn? Did you feel any trouble while choosing the award-winning delegates? What are the criteria or what should be the true criteria to give awards? decision; and that’s a pity indeed. Additionally, the controversy on whether position paper should be considered as a part of this checklist makes our lives even harder. Therefore, each member of the board narrows down to a list of 3 people and if we have any common names we keep them and discuss our differentiations-otherwise we give equal awards to more people. True criteria you ask? Well, proper organization is the key to everything but honestly this answer changes according to the MUNer and the circuit you are addressing it to. MUNTurkey.com: Alexia, what is your future plans regarding MUN Conferences? Are there any MUN conferences you are going to attend soon? How do you usually choose the MUN conferences that you attend? conference actually and the committees available. MUNTurkey.com: Except MUN, members of MUNTurkey.com would like to know you more. Could you please mention about your favourite Movies, Tv Series, Bands and Foods? Well, thank you very much and my apologies for delaying to answer due to heavy workload! Your page’s division is badass and very cool. Let me elaborate: Chair bank-an individual wants to take it to the next level, there you go! Star conferences- a well put together review and you know where to go. I could go on and on explaining why I like this page, but it all comes down to the user interface reaction feeling and when it comes to MUNTurkey, you just want to raise your placard and keep on going if a web source motivates you to go broke and attend yet another conference, then job is perfectly done! Thank you very much, Alexia, for this great interview. We hope to see you in an MUN conference soon!